Man, I've seen a few bad one's before, but nothing like this (click with caution, not for the faint of heart). Not sure of his status as of today. I'm pretty sure his left leg is at least broken. Hopefully no ligament damage, but I wouldn't be surprised. At the post-game presser Hoke told us he was taken to the hospital and was in surgery. I can only assume he's out for an extended period of time, likely spring ball as well. Our thoughts are with you Fitz. Heal up quick. Despite the loss of Toussaint on the opening drive, Michigan moved the ball down the field and scored on a 1-yard run by Devin Gardner. That drive featured a healthy mix of Devin and Denard both at QB, with only Devin throwing the ball, and multiple looks with Denard in the backfield. I'm not exactly sure what the formation was called, reverse wishbone maybe? But the 3-back set with Devin under center was a new look from this offense. I suspect we'll hear more about it from these guys. In the presser, Hoke mentioned that Borges had been wanting to get this offense to this point for the last 18 months. For reasons he declined to delve into, it just hasn't happened until now. I guess the timing of injuries and opportunities made it work this time. 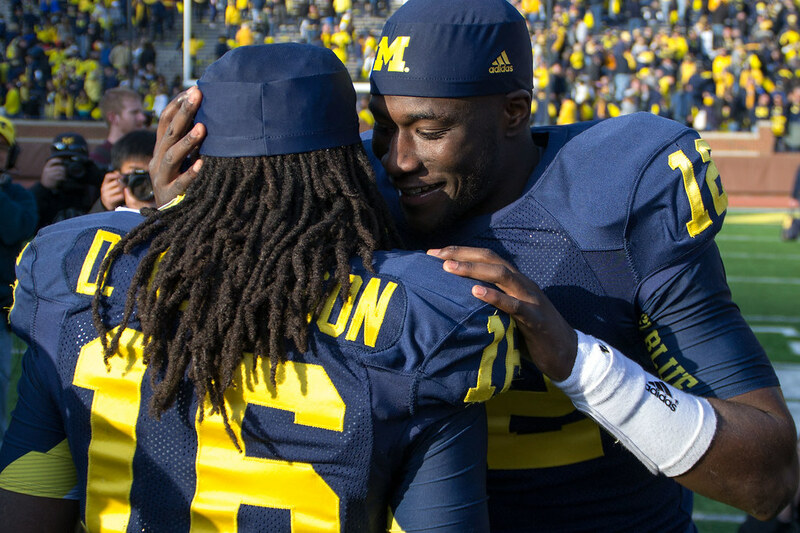 Whatever the reason, the Michigan offense hasn't performed quite like this in a while. On the first 6 possessions for Michigan, they scored 6 touchdowns. Granted, Iowa isn't very good, but that's still impressive efficiency. Adding Denard back into the lineup has given Michigan an actual rushing threat that defenses (Ohio State) will be forced to gameplan for. Before his season was taken away, Fitz was off to a great start, 3 rushes for 37 yards. 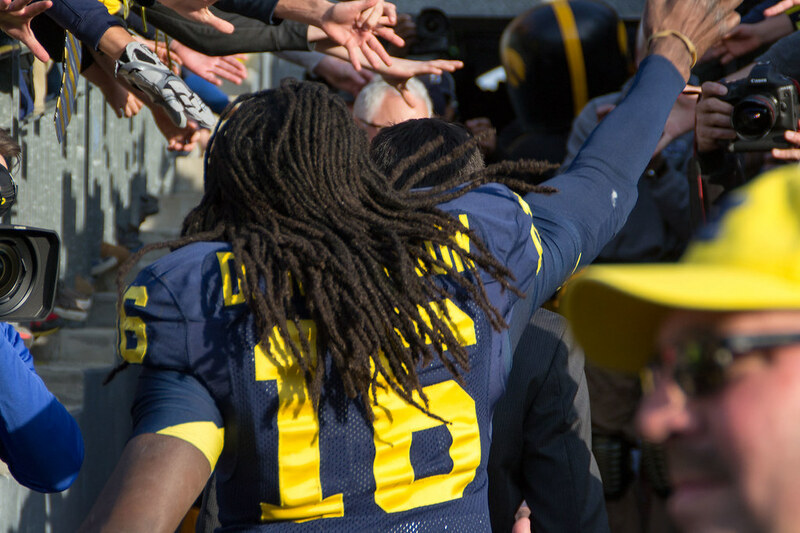 Gardner, Hayes, Smith, Rawls and Denard carried 39 times for 199 yards on the ground. Not bad. Of course that was all over-shadowed by Devin's performance. He was 18 of 23 for 314 yards and 3 touchdowns with 1 INT. That's good enough for a passer rating of 227.3. That's a big day. How about Jeremy Gallon? All of the sudden...hands! 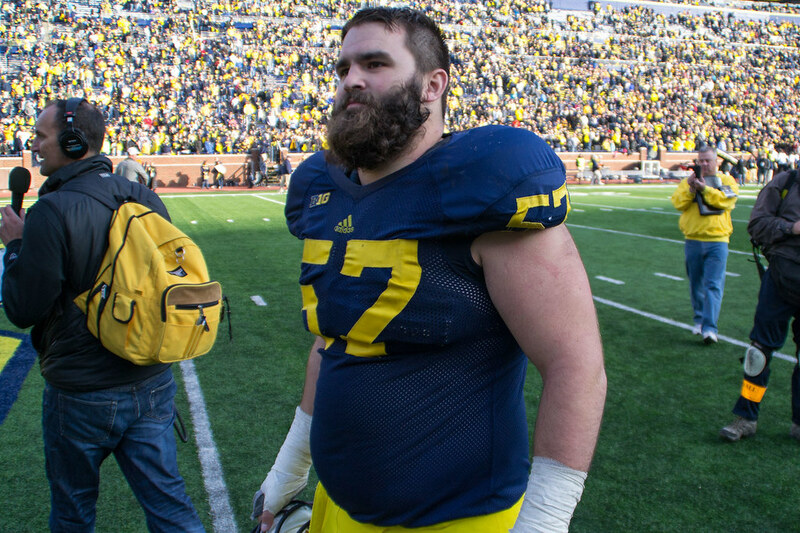 Hoke did not like what he saw. Yeah, you know but [grumble], we missed some sacks...we don't tackle...they're knocking us off the line of scrimmage earlier [long pause...grumble, grumble]. It was awful. Yep. Pretty much gonna be a tough week of practice for those guys. They must play better in Columbus. Relevant links from sites we trust. 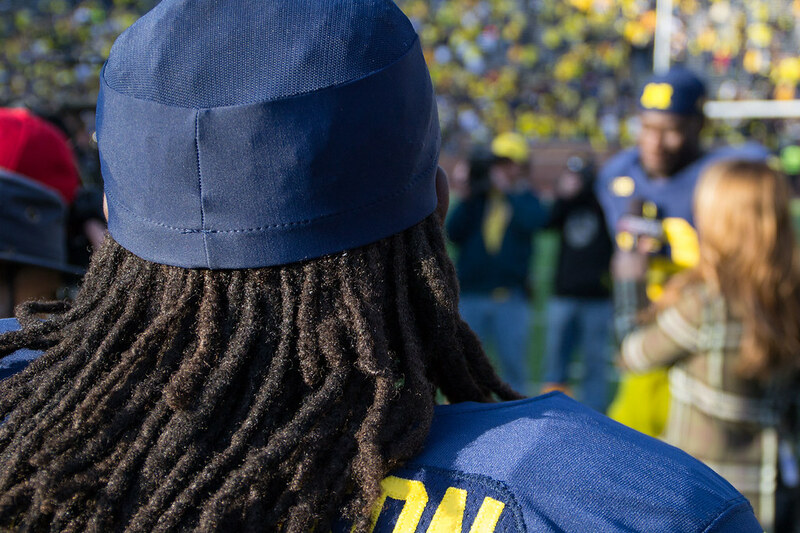 MVictors had some nice shots of the pregame ceremony for the seniors. Warning: Bear Hugs. He also snapped some nice pagentry shots as well. I call this one, simply, "Strutin". Photos from UMGoblog. 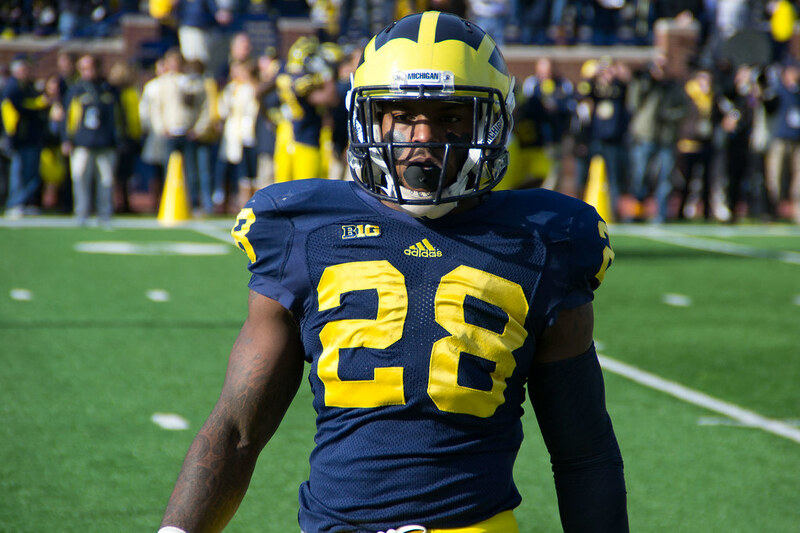 Mgoblog with some post-game thoughts. Big House Blog is an Al Borges fan this week. Don't say it. Don't even say it. You don't know, you will never know, and you will never have any way of knowing. It was against Iowa, on Senior Day, designed in part to ruin Urban Meyer's Thanksgiving. Stop telling yourself if only. Stop it. Don't let the sound of your own wheels drive you crazy. 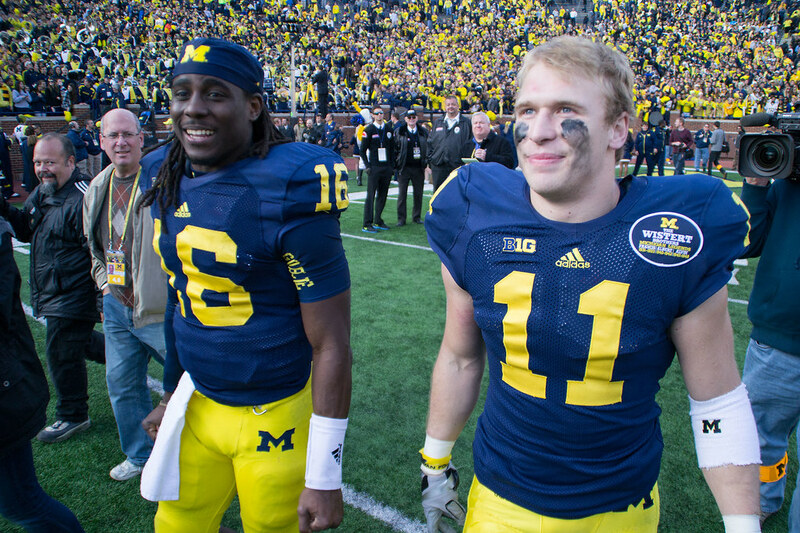 Unless Denard had agreed to it, it wasn't going to happen. So stop it. Even the coaches didn't realize Devin accounted for 6 touchdowns in this game. I'm not going to say it, but man, just think. Postgame field-level was a mix of emotions. Some of the seniors didn't celebrate quite like the underclassmen, except for Treezy, but I think this shot of Elliott Mealer taking in the celebration from afar shows how much his time at Michigan has meant to him. Eat your heart out Paul Bunyan! 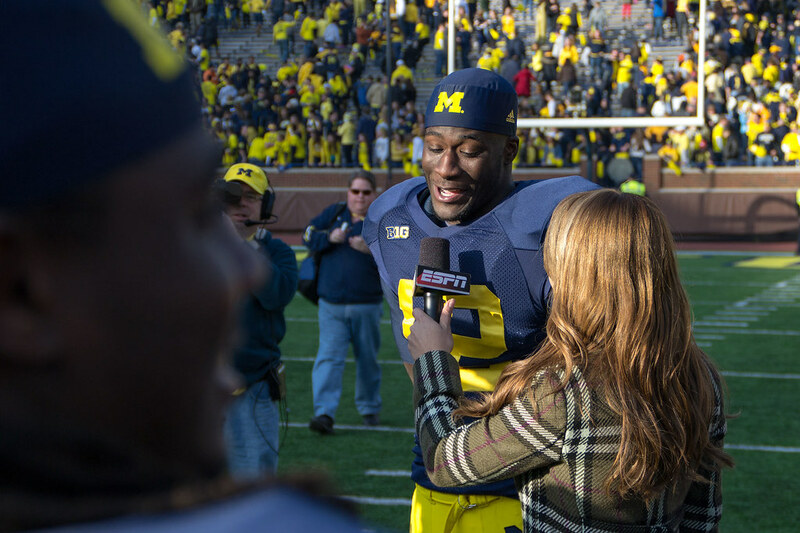 ESPN's Jenn Brown interviewed Devin and then Denard after the game, and no one enjoyed Devin getting the chance to be in the spotlight more than #16. One last time up the tunnel. 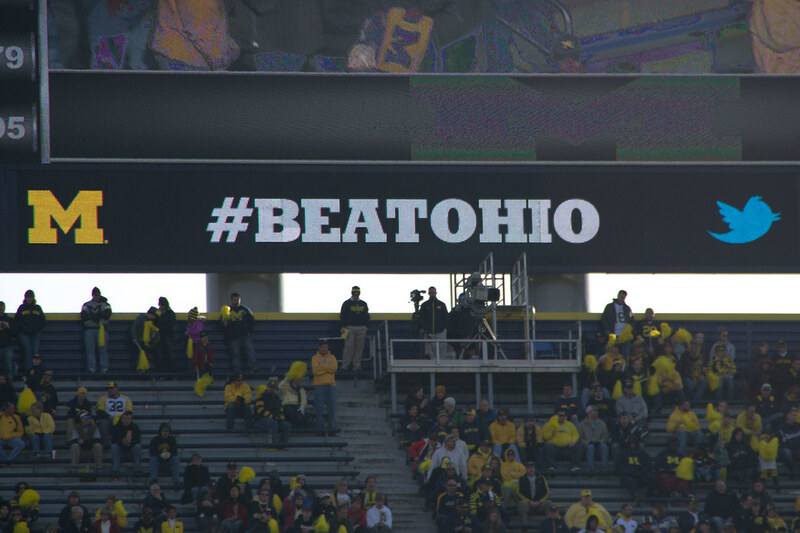 All eyes now turn to #BeatOhio. Check out my entire Iowa gallery here.